Business Insider/Mary HanburyMattress Firm was empty when we visited. 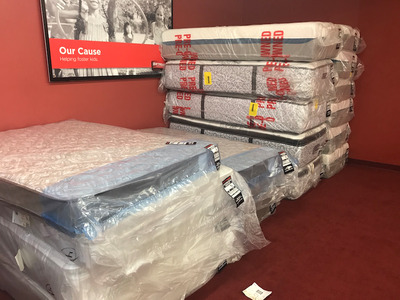 Mattress Firm is the largest specialty mattress retailer in the US, with around 3,400 stores. Casper is an online mattress brand that launched in 2014. After running a series of pop-ups around the country, it opened its first permanent store in New York in February. We visited both stores to compare the experience of shopping there. Mattress shopping is about to get a little more interesting. In February, mattress-in-a-box startup Casper opened its first permanent store, which its cofounder and chief operating officer Neil Parikh described as a Disneyland-type experience for mattress shopping. This digitally native brand is approaching brick-and-mortar retail with fresh eyes and is aiming to create a more innovative in-store shopping experience for its customers. 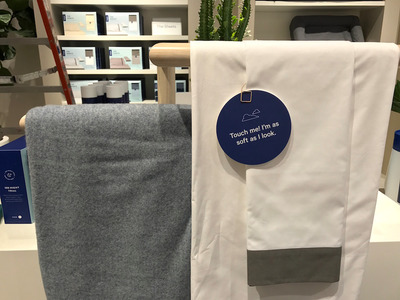 Several other e-commerce brands, such as Everlane and Bonobos, have done the same and are putting their own spin on brick-and-mortar retail by making it an integrated part of their digital offering. 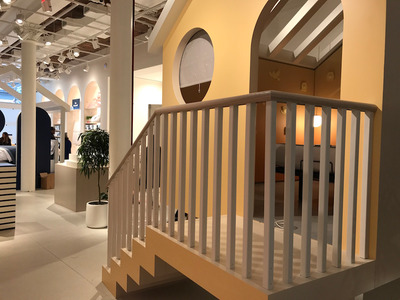 These brands benefit from not having thousands of stores on their roster to worry about, and their so-called “showrooms” can become learning experiences that are constantly adapted to the customer’s needs. 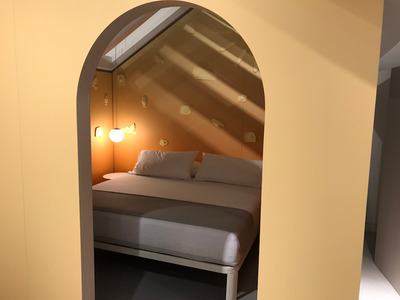 We compared the shopping experience at Casper’s new store in Manhattan’s Noho neighbourhood with a Mattress Firm store in nearby Tribeca. Mattress Firm is the largest specialty mattress retailer in the US with around 3,400 stores. It’s not uncommon to find several stores clustered together in one place. 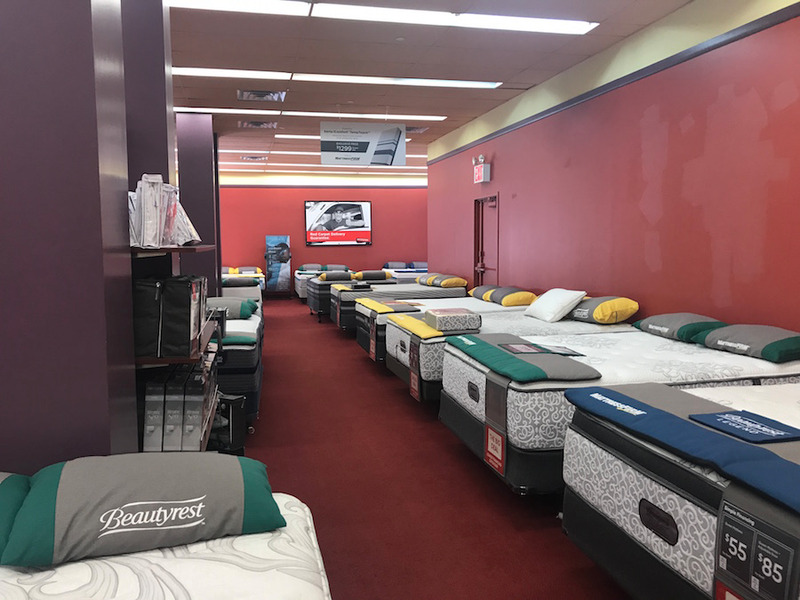 We visited a Mattress Firm store in Manhattan’s Tribeca neighbourhood. 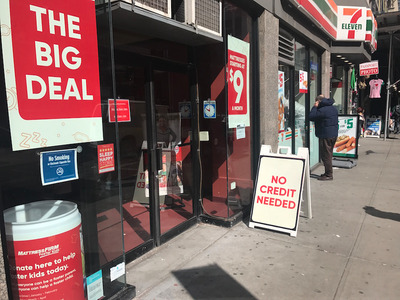 From the outside of the store, the focus was on luring you in with deals and financing options. Our visit to the store was in the mid-morning on a Wednesday. Although this was definitely not prime mattress-shopping time, the store was noticeably empty. In January, a Reddit thread that accused the store of being a front for money laundering went viral. 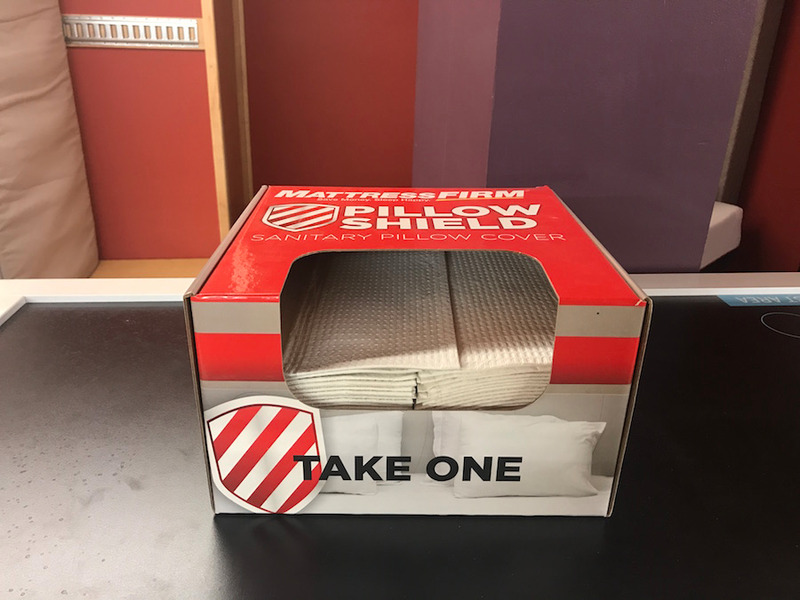 Reddit users claimed that Mattress Firm is overstored in the US and that its stores are often empty, which they claimed could be a sign of something more dubious. 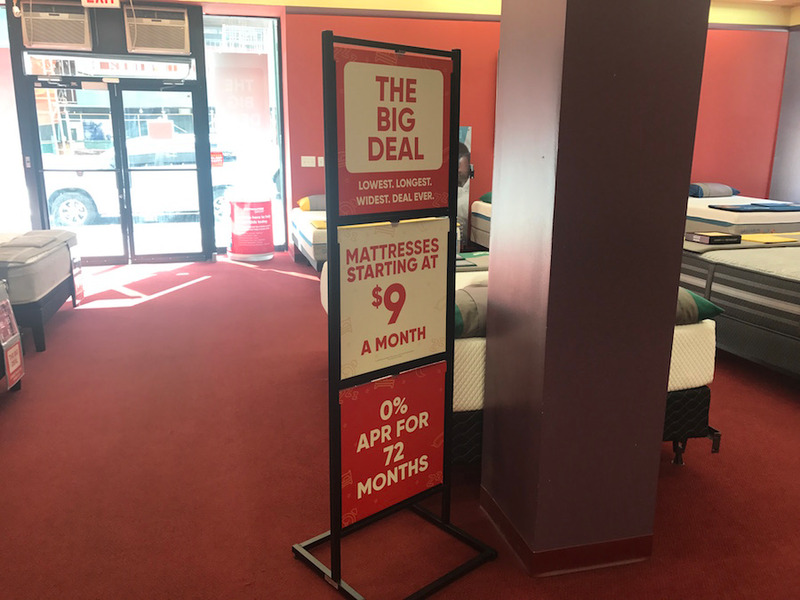 Mattress Firm has denied these allegations. 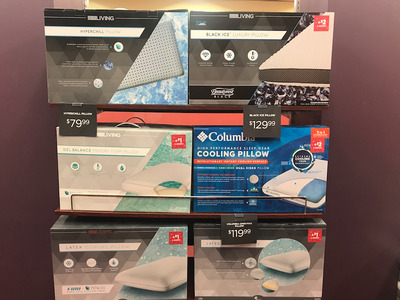 Earlier in March, Mattress Firm’s parent company, South African retail conglomerate Steinhoff Holdings, confirmed it would be closing stores this year. Though in December it had estimated it would close 200 stores, that figure has since been updated to 175. 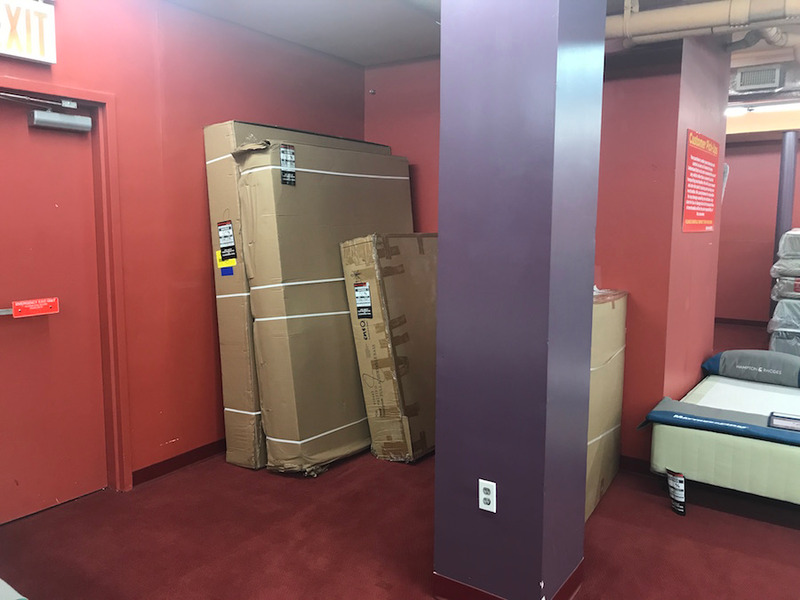 We visited two other Mattress Firm stores in New York and found that each one was completely empty during the day. We were instantly approached by a pushy salesperson who asked lots of questions and was reluctant to leave us to browse. 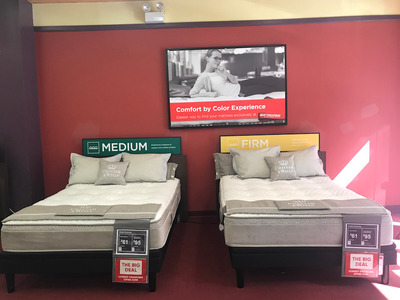 Each mattress in the store was laid out on a bed frame for shoppers to test out. The mattresses were colour-coded by firmness, which made it easy to shop. The mattresses were expensive — some cost over $US5,000 for a king size — but shoppers were constantly reminded of the financing options available. The lower floor of the store had lots of discounted mattresses. 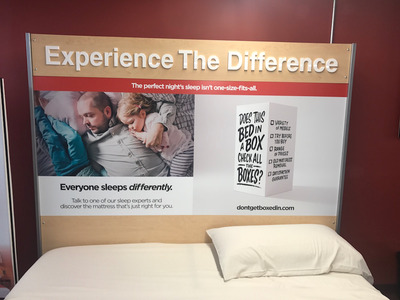 This is because the company offers a 120-day return period for customers to trial its mattresses. Returned items are then offered to other customers, often at a 50% discount. The store was huge, and there were areas of unused space. In some parts, you could find boxed-up inventory on display. Similar to Casper, Mattress Firm also sells specialty pillows. 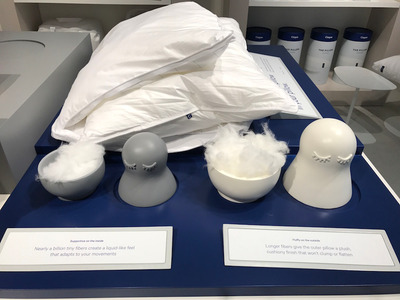 There were pillow shields available for customers to test out the bedding, which was a nice touch. There were also plenty of options for cheap bedding. These sheets were being sold for $US10. 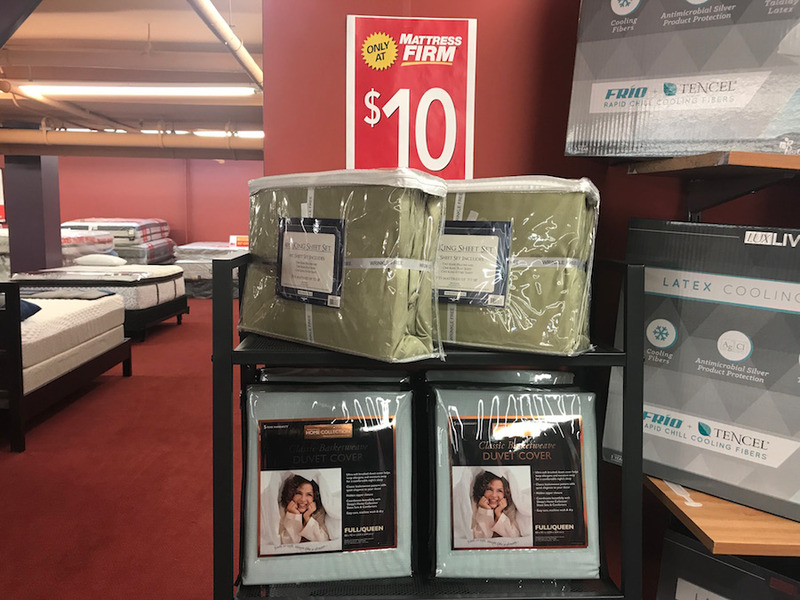 These mattress covers came with a 10-year warranty. 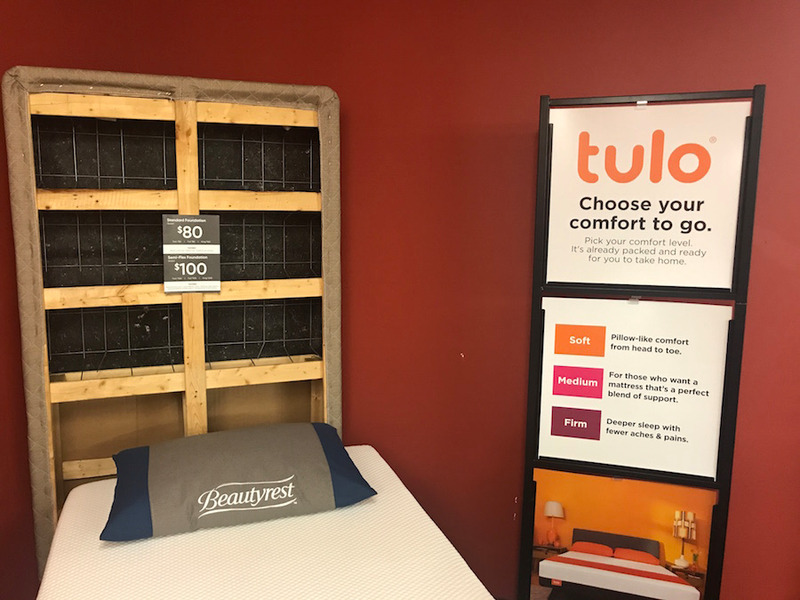 In October, Mattress Firm launched its own version of the bed-in-a-box, called Tulo. Costing between $US375 for a twin and $US800 for a California king size mattress, these products are aimed at millennial consumers. 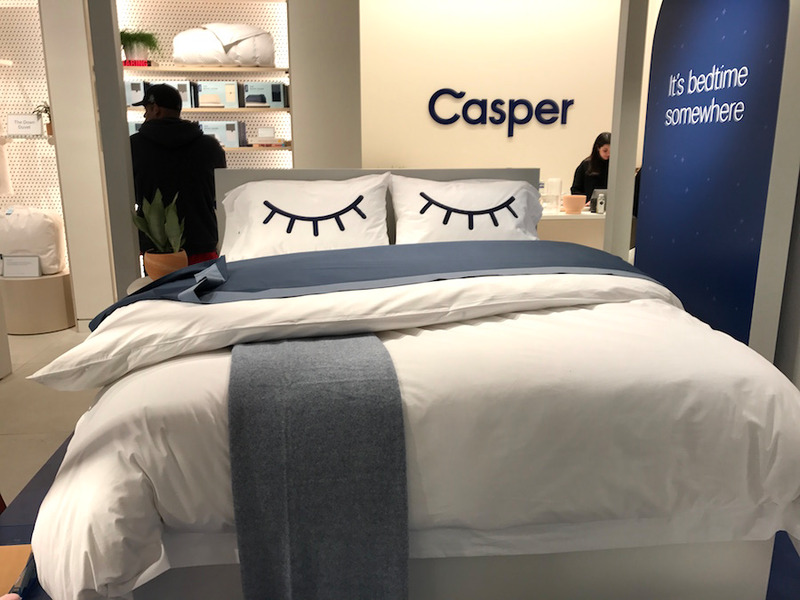 It’s clear that the company is taking its new competition seriously: there were signs discouraging customers from shopping from bed-in-a-box companies, though it didn’t mention Casper specifically. 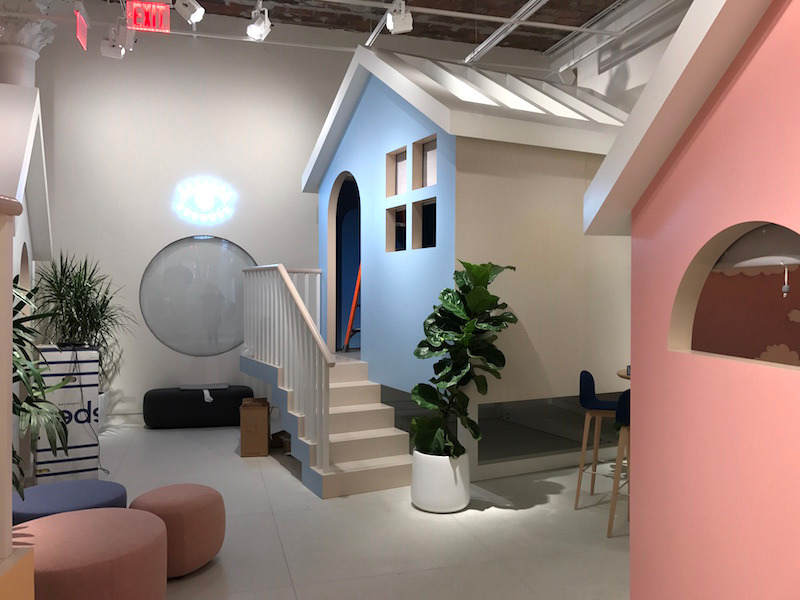 We visited Casper’s new store in New York at the beginning of March. It wasn’t open to the public at that point and was still under construction. 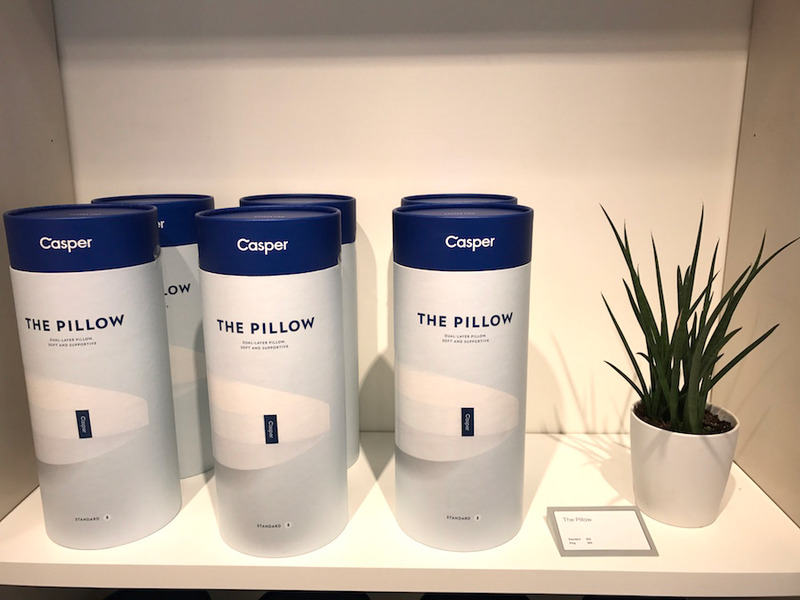 It took the Casper design team a year to conceptualize the store. It was designed to be the antithesis of a traditional mattress store. This was immediately obvious when we went in, as there wasn’t a sea of mattresses to greet shoppers. At the front of the store, there were sleeping accessories such as pillows, duvet covers, and even dog beds. The assortment was definitely simpler here, and there were fewer items to choose from. 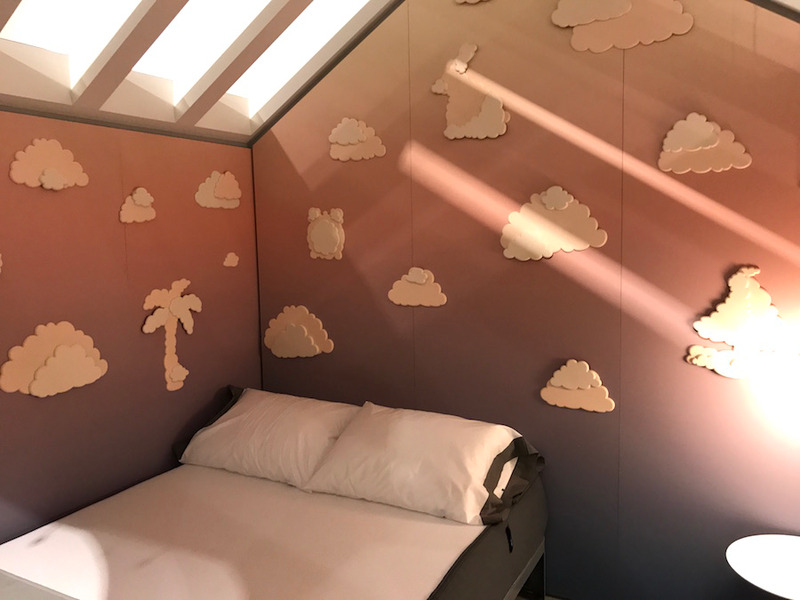 Since launching online in 2014, mattress startup Casper has become one of the biggest disruptors in the industry. Customers can order the product online, have it delivered to their home in a box, trial it for 100 days, and return it if they don’t like it. 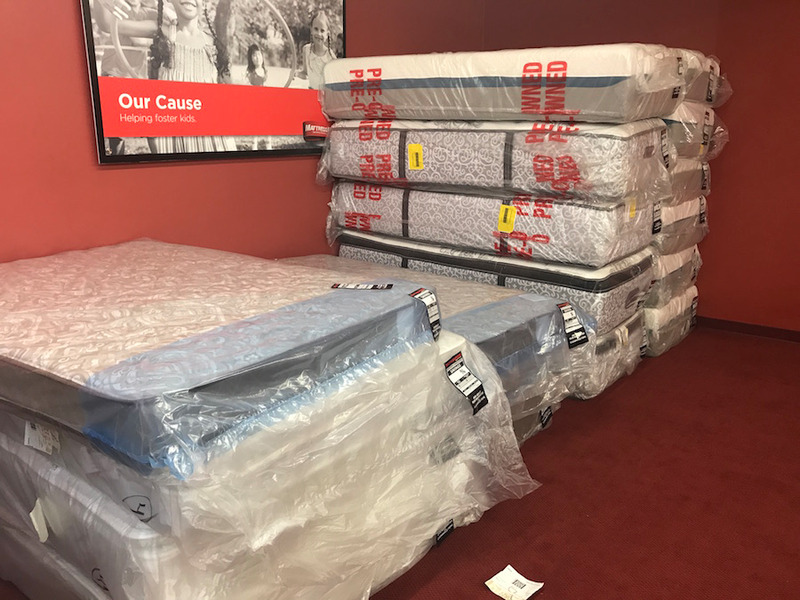 It recently expanded its mattress range to offer more pieces – a queen-sized mattress, for example, can cost from $US600 for a standard mattress up to $US1,850 for a more technical piece. The company’s total revenue since inception reached more than $US600 million in 2017, and it counts Target and 50 Cent among its investors. Casper wants to create an engaging space where customers can trial products and have fun. In the pillow section, you could touch and feel the fibres. It’s aiming to be more like an Apple store than a traditional store. Products were neatly boxed up in trendy packaging, and it was easy to buy them and then carry them away. 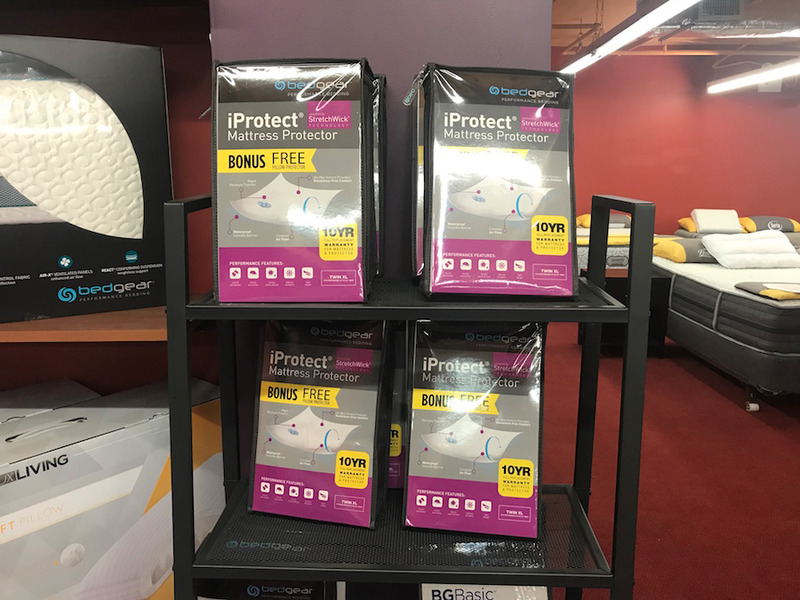 One of the big advantages of the store is that you can purchase products, including mattresses, instantly. You don’t need to wait to have them shipped to you, which is typically what other digitally native brands do to minimise the footprint of their stores. Below the shop is a large basement where inventory is stored. Products can be shipped within two hours if you live in New York. The biggest difference between Mattress Firm and Casper is how customers are invited to trial the different mattresses. The idea was to make the experience of trying a mattress more discreet. Parikh describes it as an intimate moment. “You have your own bedroom here,” he said. The open ceilings were designed to make the customer feel less trapped. 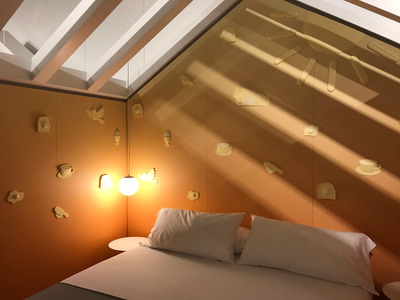 Each room has a different design and sound effects, such as bird noises that activate as you walk in. These structures take up a lot of space. If there are lots of people in the store, it might be tricky to get your turn trialing a mattress. Verdict: Overall, the shopping experience at Casper was definitely better. It was bright and airy, and its engaging displays and neatly packed-up products made it more customer-friendly. 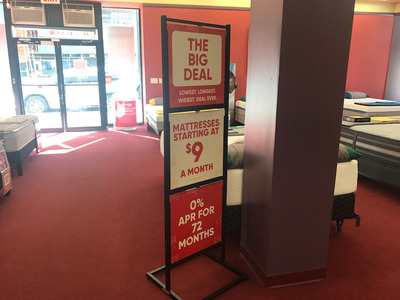 However, Mattress Firm definitely won in terms of variety. 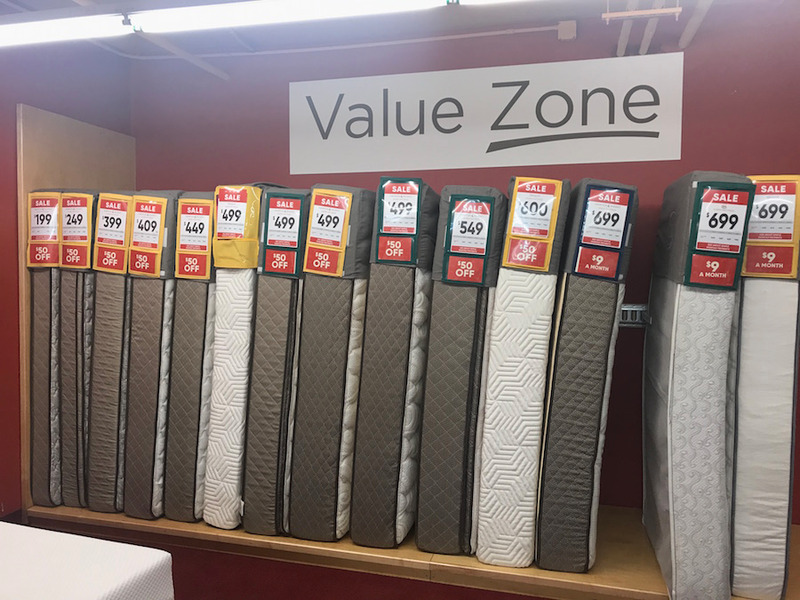 There were lots of different specialty mattresses from brands such as Simmons and Serta. The most disconcerting part of shopping in the store is just how empty it is, especially because this means there’s no escape from overzealous salespeople.